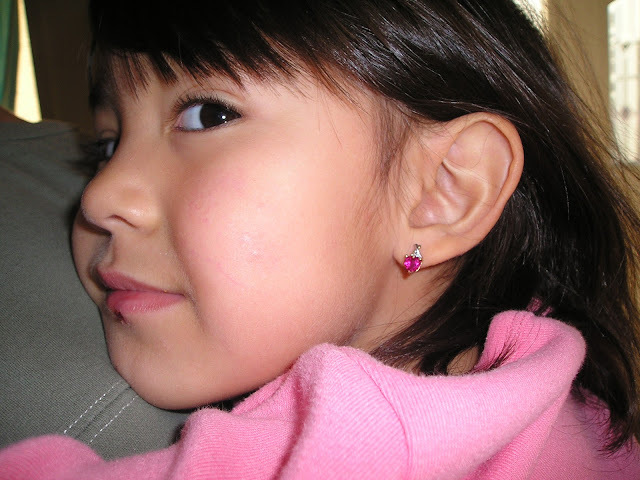 My husband sent me a pair of Ruby earrings when I was still in the Philippines but I did not use it, I thought that it would be perfect for our future daughter (we did not have kids then). Two years after that, our baby girl was born and it's her birthstone is Ruby! Perfect choice for the letter R. She looks cute in the ruby earrings. perfect for Rye! remember we have the same earrings? hehehe...it was Greg's first Christmas present for me. What a sweet story! Your daughter is beautiful and she wears those Ruby earrings well! Ah! Not just the Ruby earrings are cute but your daughter is stunning. Cute picture ! Very chic ! it's nice that you got to share those with your daughter, I guess they were meant for her! and rosy cheeks too! rye's so cute! Sweet girl and yes I like her earrings too.